Context: Sodium hypochlorite (NaOCl) is the most widely used endodontic irrigant. Although it fulfills most of the requisites of an ideal irrigant, it has certain drawbacks, chiefly severe soft-tissue damage. Allium sativum (garlic extract) is a proven antimicrobial agent that has the ability to dissolve inorganic tissue with minimal toxicity. However, its ability to remove smear layer (SL) is not known. Conventional hand-held syringe irrigation is ineffective in removing canal debris. The use of newer irrigation systems is limited owing to their high cost. Modified evacuation system (MES) may prove to be an effective yet economical alternative. Aims: This study aims to evaluate the SL removing capacity of garlic extract as an alternative to 5% NaOCl and the use of modified evacuation system for removal of irrigant along with debris from root canals. Settings and Design: Sixty-eight single-rooted mandibular premolars were divided into 8 Groups: Two control Groups A and B (4 samples each) and six experimental Groups C to H (10 samples each). Garlic extract was prepared at a concentration of 64 mg/ml. MES was set up using 21-gauge flat-end needle fixed onto chair side high-volume evacuation system. Subjects and Methods: Control groups were irrigated with normal saline, Groups C and D with 5% NaOCl and 17% ethylenediaminetetraacetic acid (EDTA), Groups E and F with garlic extract and 17% EDTA and Groups G and H with plain garlic extract. MES was used in Groups B, D, F, and H. Scanning electron microscope analysis was done to view SL at coronal, middle, and apical thirds. Results: Groups A and B showed least scores. At coronal and middle thirds, Group D shows better results, followed by Groups F and H. Apically, Group F showed better results. Groups C and H, and E and G showed similar results. All groups with MES showed better results. Conclusions: A. sativum has an SL removal capacity. MES is effective in debris removal. One of the objectives of root canal treatment is the removal of the inflamed pulp and necrotic debris to obtain a disinfected root canal space. Root canal instrumentation produces a smear layer (SL) that has to be removed for success of the treatment. The American Association of Endodontists defines the SL as a surface film of debris retained on dentin or other tooth surfaces such as enamel or cementum, after instrumentation with either rotary instruments or endodontic files. Instrumentation of the root canal forms the SL, which consists of both organic and inorganic debris, including coagulated proteins, necrotic and viable pulp remnants, odontoblastic processes, saliva, blood cells, microorganisms, and hydroxyapatite crystals. Removal of SL opens up the dentinal tubules and exposes surface collagen for covalent bonding, thereby favoring retention. Furthermore, its removal eliminates bacteria, increases dentin permeability, facilitates diffusion of intracanal medicaments, and helps to attain a hermetic seal between obturation material and the canal wall. There are several methods employed to remove SL including usage of chemical agents such as proteolytic agents, chelating agents, dequalinium compounds, organic acids, or a combination of these agents; mechanical means such as ultrasonics, endodontic microbrushes, and Quantec E Irrigation Pumps; and lasers. Garlic (Allium sativum) has the capacity to remove the inorganic tissue and has good antibacterial capacity, with minimal side effects., However, very few studies have been done on its ability to remove SL from root canals. The mechanical flushing action of conventional needle irrigation is relatively weak. Newer irrigation systems are efficient in achieving debris-free canals., However, their use is limited due to the need for special equipment and high cost. 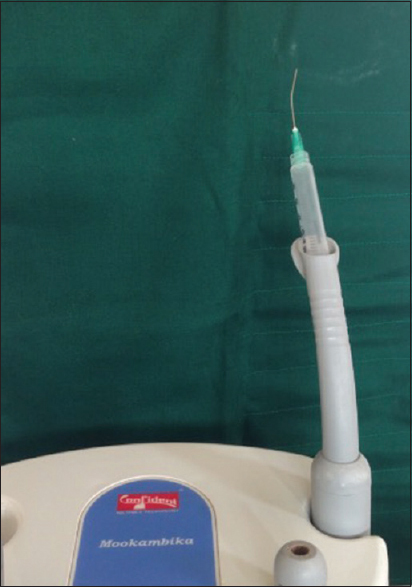 The use of modified chair-side high volume evacuation system may prove to be a more economical alternative to help prevent the apical extrusion of irrigant and debris, thereby helping to attain the objectives of root canal treatment. The aim of this study is to evaluate the SL removing the capacity of garlic extract as an alternative to 5% NaOCl and the use of modified evacuation system for removal of irrigant along with debris from root canals. Garlic extract was prepared by immersing 100 g of cleaned and peeled garlic cloves in 70% (v/v) ethanol for 60 s for surface sterilization. The cloves were placed in a laminar airflow chamber for evaporation of residual ethanol. Using a sterile mortar and pestle, they were homogenized aseptically and sieved through a double layer sterile fine mesh to obtain 100% extract. This was diluted to the concentration of 64 mg/ml using distilled water. A 2.5 ml syringe of 10 mm diameter, with a 21-gauge flat end needle 4.5 mm long was made to fit on to the chair side high volume evacuation system. The needle was bent 30°. The suction efficacy of the apparatus was found to be 8 ml/min [Figure 1]. Sixty-eight single-rooted human mandibular premolar teeth selected for the study was cleaned of superficial debris, tissue tags, and calculus. Confirmation of the presence of single canals in the samples was done using RVG (buccolingual and mesiodistal). The specimens were decoronated at the cementoenamel junction using a diamond disk and the working length was standardized to 14 mm (±1 mm). The apices of the roots were sealed with acrylic resin to prevent apical extrusion of debris. Group B: Normal Saline with modified evacuation system. Group H: Garlic Extract with modified evacuation system. Canal instrumentation was done using Gates Glidden drills Sizes 1 and 2, and stainless steel K Flex files using crown down technique up to master apical file number 40, 0.5 mm short of apex. Copious irrigation was done between each instrument delivering 3 ml of 5% NaOCl solution through a 30-gauge needle in Groups C and D; 3 ml of garlic extract in the concentration of 64 mg/ml in Group E, F, G, and H; and normal saline in Groups A and B. 5 ml of 17% EDTA for 3 min was used in Groups C, D, E, and F. The canals were flushed with normal saline between irrigating solution and 17% EDTA. In addition, in Groups B, D, F, and H modified evacuation system fitted with 21-gauge needle was introduced into the middle-third of the root canals intermittently during irrigation. At the completion of the instrumentation, each canal was finally flushed with 5 ml of sterile saline solution and thoroughly dried with sterile paper points. For sectioning of the root, longitudinal grooves were made on buccal and lingual external root surface using double-faced diamond disc at low speed with care not to penetrate the root canals. Root specimens were then split with a straight chisel into two segments in buccolingual direction. Each root half was horizontally embedded in acrylic block. Later all samples were taken for scanning electron microscope (SEM) evaluation (magnification: 4.00 K X) to determine the presence of SL in coronal, middle, and apical thirds [Figure 2]. Score 4: Heavy SL covering over 75% of the specimen; no tubule orifices visible or patent. Statistical analysis was carried out using Chi-square test with P < 0.05. This test involves calculation of a quantity in a qualitative data. It is a method to test the significance of the difference between two proportions and is used to find whether observed frequency distribution fits in a distribution of a qualitative data or whether it differs from theoretical distribution by chance or the sample is drawn from a different population. IBM SPSS Statistics for Windows, Version 20.0. Armonk, NY was used. 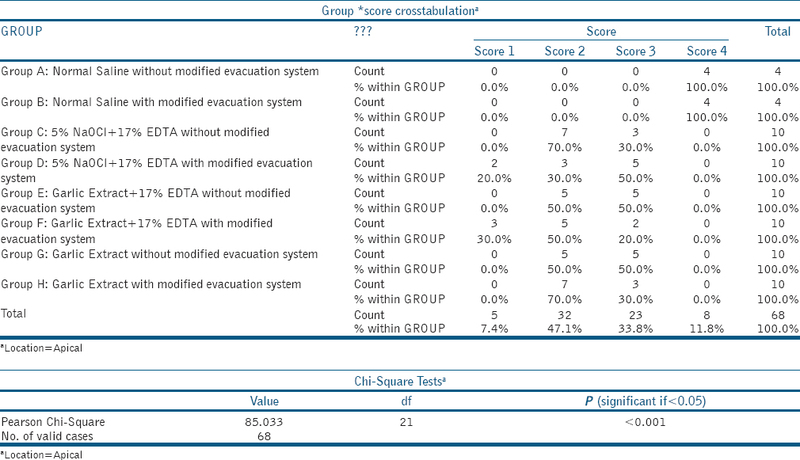 As 80% of the samples in Group D had Score 1, it proves to be significantly better in SL removal than all other groups, except for Group F, in which 70% samples had Score 1. 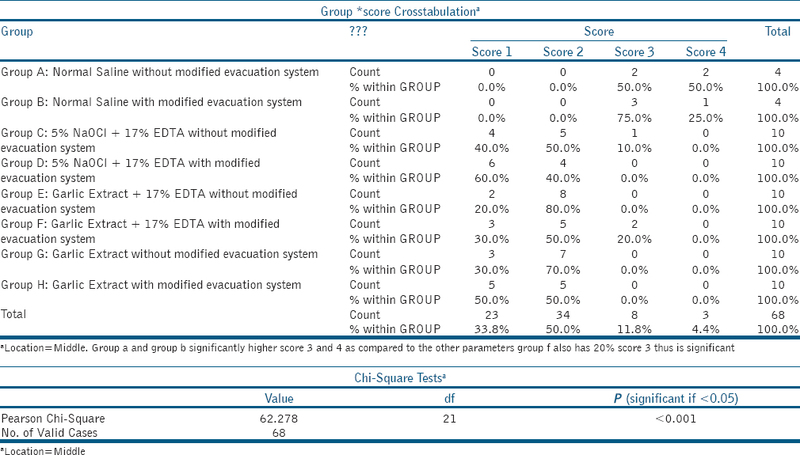 This is followed by Group E, in which 60% of the samples had Score 1, while 40% had Score 2 [Table 1] and [Graph 1]. In Groups C and H, 50% of the samples had Score 1 while remaining 50% had Score 2; and in group G, 40% of the samples had Score 1 while 60% had Score 2. 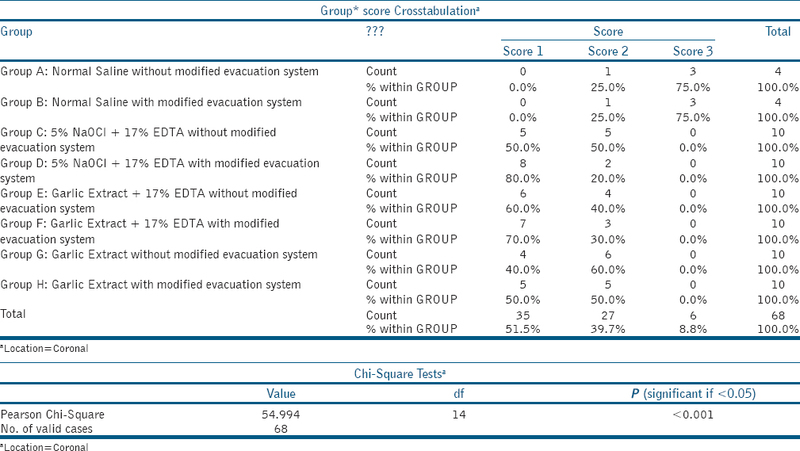 In control Groups A and B, 75% of the samples had Score 3 while 25% had Score 2, which shows these groups remove SL significantly lower than the others. None of the samples had Score 4 at the coronal third. At the middle third of the canals also, Group D showed better SL removal which is statistically significant than other groups, except for Group H [Table 2] and [Graph 2]. About 10% of the samples in Group C and 20% in Group F had Score 3, while none of the other experimental groups had Scores 3 or 4. Group F has better SL removal at the apical third; however, the difference is not statistically significant to Group D. The groups have 30% and 20% samples with Score 1, respectively. Groups C and H has similar results, where 70% samples have Score 2, while remaining have Score 3. Likewise, Groups E and G have similar results, where 50% of the samples have Score 2, while remaining 50% have Score 3. 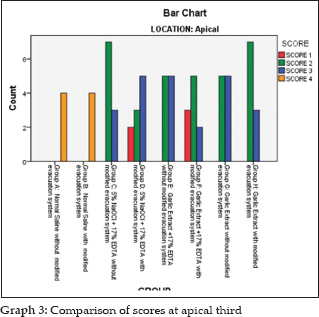 None of the experimental groups have Score 4 [Table 3] and [Graph 3] and [Figure 2]. In control Group A, in which MES was not used, SEM images show large amounts of debris, completely covering the dentinal walls, indicative of the lack of tissue dissolving property of normal saline even in the coronal third of the root canals. In control Group B, where MES was used the SEM images show large amount of loose and floating debris and minimal opening of dentinal tubules, indicating that MES could remove debris and dislodge it from the canal walls. In Group C (NaOCl, 17% EDTA without MES), at the coronal third, all the dentinal tubules were open with few specks of loose debris present on the tubule openings. However, in Group D (NaOCl, 17% EDTA with MES), all tubules were open, with no specks of debris, indicative of the efficiency of MES. It has been reported by Shih et al. that 5.25% NaOCl was strong enough to kill the bacteria commonly present in the canal; however, this concentration was highly toxic and irritating. Furthermore, 0.5% NaOCl dissolved the necrotic tissue but had no effect on Staphylococcus aureus. In the present study, 5% NaOCl was used, for better tissue dissolving property. 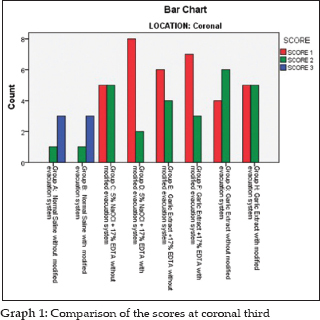 Since Groups C and E show similar results at the coronal third, it implies that the efficacy of garlic extract in combination is equivalent to that of NaOCl and EDTA. Group D shows less intertubular distance, compared to Group F, and absence of peritubular dentin, due to the organic tissue dissolving property and formation of the reverse hybrid layer by NaOCl. The higher viscosity of garlic extract compared to NaOCl could lower its diffusibility and wettability, rendering it less effective than NaOCl. Moreover, the groups in which garlic extract was used as irrigant, SEM images show minimal opening of dentinal tubules without affecting their structural property. This implies that it would not have an adverse effect of the bond strength of root dentin with root canal sealer, as the collagen fibers would not be destructed. In this study, garlic extract was diluted to a concentration of 64 mg/ml in accordance with a study by Khan L et al., as this concentration was most potent as an antimicrobial. At room temperature, the extract can be stored for maximum 7 days, while at −20°C temperature, it can be stored for 90 days. In the middle third also, Group D shows to be most effective in removing SL and is statistically significant compared to all groups except Group H. All groups with MES show presence of less debris. The groups without MES have thicker, more adherent debris. The dentinal tubules were visible, and debris was considerable less in the coronal and middle thirds of the canals when compared to the apical thirds due to the direct action of irrigant at these locations and the ability of the debris to be expulsed out more readily. At the apical third of the specimen, even the NaOCl groups show low score, which can be explained by the narrow canal configuration and lesser number of dentinal tubules at the apical region. Moreover, since the apices of the specimen were sealed, there was no apical extrusion of debris, and the debris that is not expulsed out of the canal tends to remain at the apical region. In the present study, although the use of modified evacuation system shows better SL removal at coronal, middle at apical thirds of the samples in all groups, there is no statistically significant difference. A larger sample size could perhaps give a significant difference. With regard to the cleanliness achieved in the different areas of the root canal, it may be pointed out that the coronal and middle thirds were those that presented greater capacity to be cleaned. This may be explained as being due to the irrigation system having attained the apical third less efficiently, as a result of the size of the aspiration needle and needle tip not reaching the complete extension of the working length of the root canal, thus not allowing the irrigant solutions to achieve the desired result. These limitations have also been pointed out by Pereira. In the apical thirds of the specimen, the groups with MES showed the presence of loose, scattered clusters of debris whereas the groups without MES showed the presence of debris that adhered to the dentinal walls. This suggests that use of MES does help to dislodge debris; however, its evacuation efficacy is probably not strong enough to completely eliminate the debris from this location of the root canal. This could possibly be due to the nature of dentinal tubules which are irregular and less in number. Whittaker and Kneale also suggested relatively fewer dentinal tubules per unit area being present in the apical third of the root canal wall., Moreover, since the apices of the specimen were sealed, there was no apical extrusion of debris, and the debris that is not expulsed out of the canal tends to remain at the apical region. According to the findings and within the limitations of this study, it can be concluded that: A. sativum has an SL removal capacity, but it is less at the tested concentration when compared to the EDTA and NaOCl groups, the integrity of intertubular dentin was maintained when garlic extract was used as irrigant, combination of A. sativum and 17% EDTA shows better results at apical thirds when compared to plain garlic extract, and is not significantly different from the NaOCl and EDTA groups, and use of modified evacuation system shows better results in all groups, although not statistically significant. Spencer HR, Ike V, Brennan PA. Review: The use of sodium hypochlorite in endodontics – Potential complications and their management. Br Dent J 2007;202:555-9. Eswar K, Venkateshbabu N, Rajeswari K, Kandaswamy D. Dentinal tubule disinfection with 2% chlorhexidine, garlic extract, and calcium hydroxide against Enterococcus faecalis by using real-time polymerase chain reaction:In vitro study. J Conserv Dent 2013;16:194-8. Koppolu M, Mathew VB, Thangala V, Kowmudi M. Evaluation of effect of Allium sativum on smear layer removal in root canals – An ex vivo study. Ann Essences Dent 2012;4:17-22. Khan L, Paulino EGM, Lim D, Nadela F, Yadav R, Birring OJS. Anti-microbial efficacy of Allium sativum against Streptococcus mutans biofilm formation on orthodontic mini-implants. Journal of Orthodontic Research 2014;2:129-134. Castagnola R, Lajolo C, Minciacchi I, Francesco S. Efficacy of three different irrigation techniques in the removal of smear layer and organic debris from root canal wall: A scanning electron microscope study. Giornale italiano di endodonzia 2014;2:79-86. Menezes AC, Zanet CG, Valera MC. Smear layer removal capacity of disinfectant solutions used with and without EDTA for the irrigation of canals: A SEM study. Pesqui Odontol Bras 2003;17:349-55. Mello I, Robazza CR, Antoniazzi JH, Coil J. Influence of different volumes of EDTA for final rinse on smear layer removal. Oral Surg Oral Med Oral Pathol Oral Radiol Endod 2008;106:e40-3. Shih M, Marshall FJ, Rosen S. The bactericidal efficiency of sodium hypochlorite as an endodontic irrigant. Oral Surg Oral Med Oral Pathol 1970;29:613-9. Mukhtar S, Ghori I. Antibacterial activity of aqueous and ethanolic extracts of garlic, cinnamon and turmeric against Escherichia coli ATCC 25922 and Bacillus subtilis DSM 3256. Int J Appl Biol Pharm Technol 2012;3:131-6. Alrazhi BA, Diab AH, Essa SA, Ahmed GM, Ezzat SM. Antibacterial activity of the ethanolic extracts of Allium sativum L. bulbs and Zingiber officinale roscoe rhizomes as irrigating solutions. World J Pharm Pharm Sci 2014;3:324-7. Belguith H, Kthiri F, Chati A, Sofah A, Hamida JB, Ladoulsi A. Study of the effect of aqueous garlic extract (Allium sativum) on some salmonella serovars isolates. Emir J Food Agric 2010;22:189-206. Deresse D. Antibacterial effect of garlic (Allium sativum) on Staphylococcus aureus: An in vitro study. Asian J Med Sci 2010;2:62-5. Block E. The chemistry of garlic and onions. Sci Am 1985;252:114-9. Bakri IM, Douglas CW. Inhibitory effect of garlic extract on oral bacteria. Arch Oral Biol 2005;50:645-51. Elsom GK, Hide D, Salmon DM. An antibacterial assay of aqueous extract of garlic against anaerobic: Microaerophilic and aerobic bacteria. Microb Ecol Health Dis 2000;12:81-4. Abubacker EM. Efficacy of crude extracts of garlic (Allium sativum Linn.) against nosocomial Escherichia coli, Staphylococcus aureus, Streptococcus pneumoniea and Pseudomonas aeruginosa. J Med Plants Res 2009;3:179-85. Mohan S, Gurtu A, Singhal A, Vinayak V. Naturopathy and endodontics –A synergistic approach. J Dent Sci Oral Rehabil 2012;1:27-9. Gutmann JL, Zehnder M, Levermann VM. Historical perspectives on the roots of the apical negative pressure irrigation technique in endodontics. J Hist Dent 2014;62:32-40. De-Deus G, Reis C, Paciornik S. Critical appraisal of published smear layer-removal studies: Methodological issues. Oral Surg Oral Med Oral Pathol Oral Radiol Endod 2011;112:531-43. 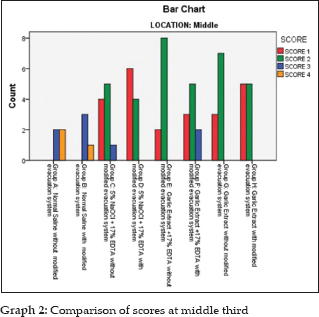 Fukumoto Y, Kikuchi I, Yoshioka T, Kobayashi C, Suda H. An ex vivo evaluation of a new root canal irrigation technique with intracanal aspiration. Int Endod J 2006;39:93-9.